The Independent National Electoral Commission (INEC) says the governorship supplementary election scheduled for March 23, will hold across 14 local government areas of the state. Kasim Gaidam, resident electoral commissioner (REC) of Adamawa, disclosed this to NAN on Sunday in Yola, the state capital. Gaidam said the election will be conducted in 29 wards (registration areas) and 44 polling units where over 40,000 votes were cancelled in the March 9 governorship election. Gaidam, however, explained that the election was declared inconclusive as provided by law based only on official registered voters, not permanent voters cards (PVCs) collected or accredited voters. 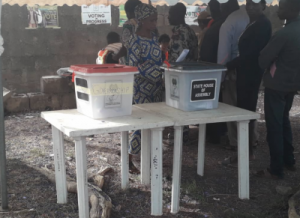 The results of the governorship election announced by Andrew Haruna, INEC returning officer, showed that the PDP candidate, Ahmadu Fintiri scored 367,472 votes, while Muhammad Bindow, the APC candidate and incumbent governor, secured a total of 334,995 votes, leaving a margin of 32,476 votes.